Carcashpoint were a god send to me in a time when financial difficulty hit. There are no hidden fees & everything is explained to you in simple terms. Darren who came out was a pleasure to deal with & Paul's help & advice was second to none. I used this service to consolidate my debts and only now have 1 payment to make each month. The quicker you pay, the less interest you pay. The whole process is very quick & easy & the money was in my bank within hours. Right from the first contact made with Car Cash Point, I knew we had made the right decision of which company to use for a Logbook Loan. Everything was clearly explained and all was dealt with very efficiently and the money was in our bank within 24 hours. The people we dealt with both in person and over the phone were really helpful and polite. Overall I cannot fault the Car Cash Point and would most definately recommend them to anybody looking for a Logbook Loan. The service at Car Cash Point was fantastic - the whole loan was delivered in a courteous, friendly and efficient manner. Took away the stigma that is attached with most Logbook Loans, every aspect of the loan was explained in detail and the funds transferred in no time. I would definitely recommend Car Cash Point and use again. I was extremely pleased with the service 'Car Cash point' was able to provide. There service was second to none. Staff were re-assuring and extremely professional with no pressure given when I applied for my Logbook Loan. The service was extremely quick - a short meeting and the cash was in my account on the same day. Not being able to borrow money the conventional way due to personal circumstances, Car Cash Point was able to provide me with a 5 star service. Thank you and I would highly recommend to anyone in similar circumstances. The service at Car Cash Point was second to none, the Logbook Loan was arranged very quickly and every thing promised on website was true, I didn't believe it was possible, but they never let me down. I met them at 5.30pm and money was in my account by 9.30pm the same night and the representative drove all way from Leeds to Newcastle to make sure it was dealt with as soon as possible, Anyone needing a logbook Loan look no further this is the company YOU need! I will recommend Car Cash Point unreservedly, they are the cheapest, quickest, most helpful and most efficient people I have every dealt with. Thank your Car Cash Point you were there when I needed money fast. To: All at the CCTA, Watchdog, OFT and all staff and directors at CarCashPoint. I had a meeting today with Mr Gilbert and Mr Hilburn, both of CarCashPoint (CCP) and would like to correct the record on what my position is with regards CCP account 518. I am completely satisfied that CCP have acted fairly and complied with relevant legislation, further more they have acted more in my interests rather than their own. I made a mistake in acting on principle, when the principle was wrong - and I did not understand key facts and failed to consider the position reasonably. Mr Hilburn, on behalf of CCP, has acted fairly in all regards, in fact he has been very helpful, and I would like to apologise sincerely to him and his company for the effort I have put him through, and the unfair comments I have made about him and his company. I would especially like to apologise to Mr Gilbert - who should not have been put through this and is a completely innocent party who was not in a position where he should have to defend himself against my comments to your organisations. I would like to state further that any pressure I felt in dealing with Mr Gilbert was due to circumstances and not down to Mr Gilberts actions - he was professional and helpful. To Mr Hilburn, I failed to grasp the legal backing behind his actions and the fairness in his and CCPs processes. Despite all of this, Mr Hilburn was man enough to continue to deal fairly where I had long stopped seeing things in a fair way. I failed to trust in CCPs statements and treated them in an unreasonable manner. I became prejudiced against them having read horror stories of a company no longer trading in the industry, and became prejudiced against the industry in general. This was despite a complete lack of reason to suspect CarCashPoint. To the CCTA I would like to apologise for making them investigate a situation that should not have been, failing to settle on the conciliation offer they arranged, and for failing to correspond in a complete way. To the OFT I would like to state my support for CCP - I now see they have exceeded the requirements, fairness and the industry norm. To BBC Watchdog, there is no story here. Lastly I would like to personally thank Mr Hilburn and Mr Gilbert for providing a valuable service, that is high risk to people when they need it most. Whilst there is a high interest rate in the industry and the rewards for well kept accounts are high I appreciate the high losses that go alongside them and recognise and commend Mr Hilburn and Mr Gilbert for seeking resolution even when they need not and it is not necessarily in their financial interests, but in the interests of their customer and reputation. I would like to undo any damage I have done to Mr Hilburn, Mr Gilbert and CCPs reputation. The result of this shows that they should in fact be considered more highly as a result of the past weeks problems. I would like to try to explain and justify my actions and comments, but the easiest explanation is that circumstances were involved that were beyond my responsibility and were not related to CCP or their employees/directors. This explanation is only partial at best - CCP, Mr Gilbert and Mr Hilburn have always held the higher ground on this - legally, morally and ethically. Car Cash Point has demonstrated to me that they are a credible alternative to other log book loan companies. Complete transparency in processing the loans allows you to make the right decisions and understand how the loan works in practice. The customer service has been second to none, and in particular the empathy conveyed by Paul Hilburn really helped me to resolve a financial 'sore point' and it is because of his excellent service, and the way the whole process is managed that I have taken out another loan with Car Cash Point. Thank you so much for sorting out payment so promptly for me today. I was very impressed with your rep. Chris, he was very professional and put me at ease straight away. I'd also like to thank you and your company for an extremely efficient and courteous service and I would have no hesitation in recommending you to anyone. I looked at various providers on the Market and chose Cash Cash Point for several reasons. The time between making an enquiry and getting a call back, to arranging for an agent to see me to getting the funds was short and efficient. Customer service was good - there were no pushy sales tactics and all aspects of the agreement were given upfront and the terms were made very clear. The repayment plan means the installments are kept low and after a short period there is the option to make over payments or to clear the balance with no penalty. Very flexible service and no messing around!! 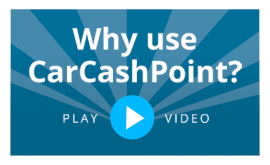 I would recommend Car Cash Point as a great alternative to any of the providers that I looked into prior to taking a loan out.